No election was ever won because of statistical revisions. Yet the recent revisions to GDP data, backdated to 1993-94, have sparked intense political debate. The revisions show that GDP growth averaged a record 8.87% during the first term of the UPA coalition (2004-2009), declining to 7.39% during its second term (2009-10 to 2013-14). Then Narendra Modi came to power promising “achhe din” (good times). Alas, growth in his first four years has averaged only 7.35%. This represents a half-baked dividend on his half-baked liberalisation. Astonishingly, Modi looks like ending with a five-year GDP growth average no higher than that of UPA-2. Who would have thought that likely when he came to power after two years of UPA floundering amidst policy and administrative paralysis? China’s slowdown means that India under Modi is the world’s fastest-growing major power, but that means little to voters expecting economic acceleration. Rather than take courage in both hands and go for radical economic reform, Modi has opted for timid incrementalism. He hoped such incrementalism would add up over five years, ensuring re-election. That approach once seemed plausible. But not any more. The opposition castigates Modi for demonetisation of the rupee, and the distress it caused in the winter of 2016-17. The BJP calls demonetisation a very worthwhile sacrifice to attack black money and improve tax honesty in the long run. However, it reduced GDP that year by just 0.5-1.0%, which implies a fall of 0.1-0.2% in Modi’s five-year average. That is only marginal. A Times Now poll earlier showed that 20% of those surveyed viewed demonetisation as among Modi’s finest achievements, while another 20% listed it among his biggest blunders. On balance, it has probably made little or no difference to voters. 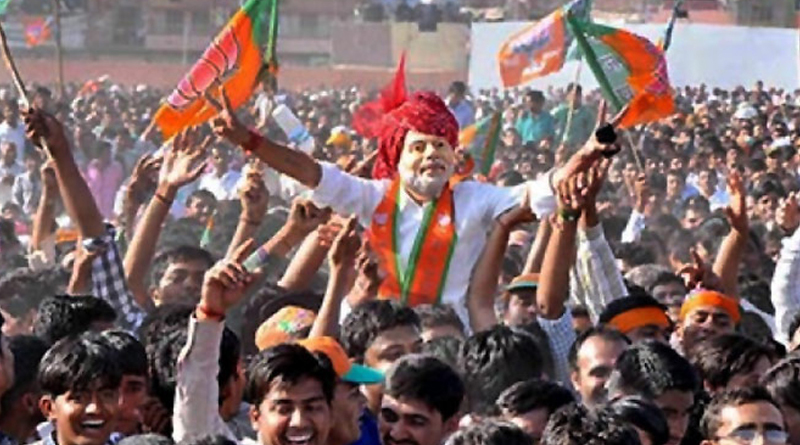 Most politicians (and political analysts) think elections are won by “jod-tod”, the making and breaking of coalitions of vote banks ranging from caste and religious groups to occupational and sub-regional groups. No doubt shifting combinations of vote banks, and indeed of political parties, have a substantial impact on electoral outcomes. So do political and global conditions. But so too does economic performance. An Economic Times analysis of election data some years ago estimated that if an incumbent significantly accelerated GDP growth compared with his predecessor, he had a 60% chance of getting re-elected. Modi has not made the cut on this measure. That does not guarantee, of course, that he will lose. The Economic Times model suggests that even economic sluggards can win 40% of the time. But this means Modi must pull something else out of his hat, and it is not clear what that could be. Raising communal tensions is unlikely to work: it loses more than it gains from the vital swing voters in the ideological centre. The BJP can say, rightly, that macroeconomic fundamentals have improved under Modi. Inflation has come down sharply, the fiscal deficit has come down, and the current account deficit is under control. Yet, in the final year of his term, Modi faces headwinds on all these three fronts. Inflation is rising, prompting the RBI to raise interest rates twice to counter it. Shortfalls in GST collections and public sector disinvestment suggest that the fiscal target of 3.3% of GDP will be difficult to meet. The current account deficit is expected to widen from 1.9% of GDP last year to 2.6% this year — cause for caution though not yet alarm. Public memory is short. Hence most politicians are sceptical of analyses based on five-year GDP growth averages. What matters at election time is the public mood, which is influenced far more by recent events than fiveyear averages. UPA-2 had a reasonably good five-year average of 7.39%, but its last two years witnessed significant deceleration amidst political paralysis and accusations of corruption. That downswing more than offset the decent performance in the first three years. Modi’s five-year average is lacklustre, thanks principally to a dip in growth due to demonetisation and the initial glitches of the Goods and Services Tax in 2016 and early 2017. But after that, growth has accelerated quarter after quarter. If Modi can keep this up, and cross 8% growth in his final year, that finishing burst could be electorally crucial. He will be tempted to achieve that through last-minute populist giveaways. But experience suggests that election budgets, replete with freebies, do not win elections. And it may be too late to go for major reforms, which can take time to yield results. Had Modi been a bold and courageous reformer in his first three years, he would have been in a much stronger position today.